A childhood favorite kicked up with bacon and three kinds of cheeses. There will be no picky eaters (or leftovers!) 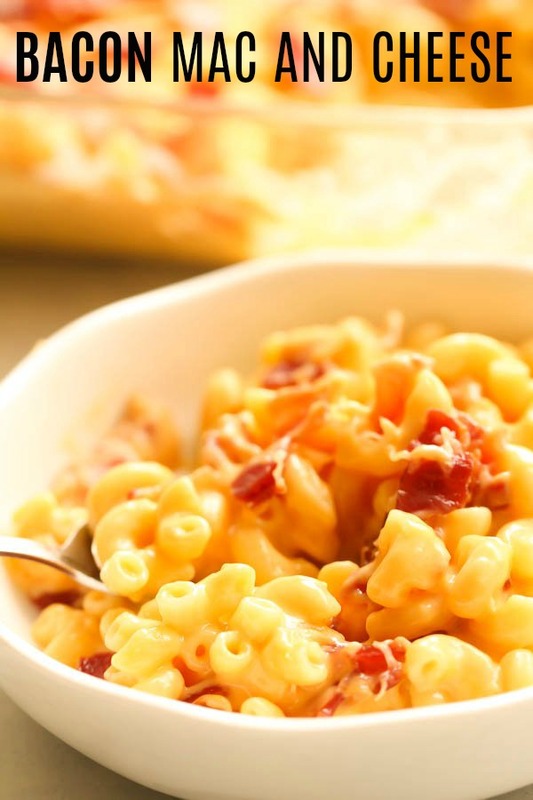 when you serve this homemade Mac and Cheese with bacon. A childhood favorite kicked up with bacon and three kinds of cheeses. There will be no picky eaters (or leftovers!) when you serve this Bacon Mac and Cheese. 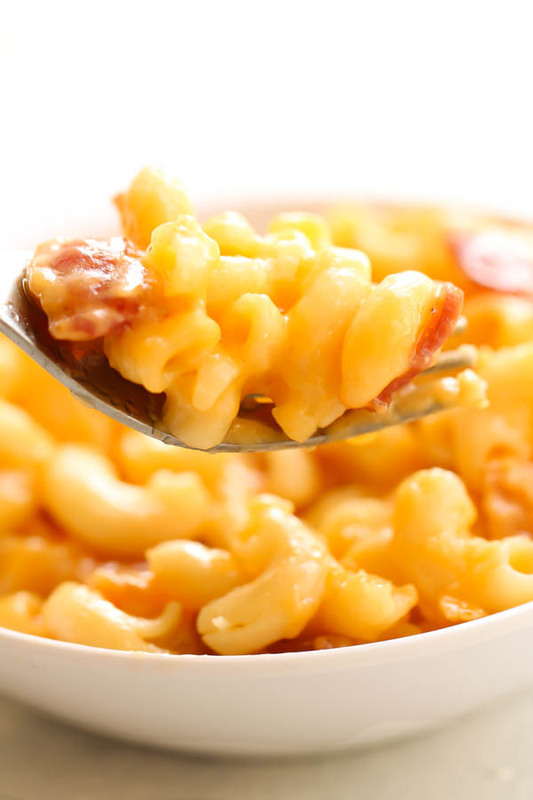 IS HOMEMADE MAC AND CHEESE HARD TO MAKE? A lot of our readers are deterred from making homemade mac and cheese because it seems so tough to make. The good news is it takes almost the same amount of time to make it from a box as it does to make it from scratch! If you’re still worried, we have a few tips for you. Stick with elbow macaroni or small shells for your pasta. Do not overcook your pasta or you’ll end up with a sticky blob. Use plenty of real cheese, don’t skimp. Cheese is part of the recipe name, so it is definitely important. Cook bacon in a skillet until done. Drain well on a paper towel and crumble into small pieces. Set aside. Heat a pot of water to boiling. Add the pasta and cook as directed on the package. When finished, drain the pasta reserving 1/2 cup of the water. Leaving the cooked pasta in the pot, add the butter and stir until melted. Heat the evaporated milk in a separate saucepan over medium heat. Stir occasionally until it just starts to simmer. Turn the heat to low and add the cheddar cheese and Monterey Jack cheese. Stir until melted. Then remove from heat and add the 1/2 cup of reserved water from the noodles. Season with salt and pepper. Then add the cheese sauce to the cooked pasta in the other pot. Stir well until all of the pasta is coated with the cheese sauce. Then add half of the cooked bacon and stir into the pasta mixture. Place the mixture in a lightly sprayed 9×9 baking dish. Sprinkle the other half of the crumbled bacon and Parmesan cheese over the top. Broil until the top is golden and begins to bubble, about 2-3 minutes. Let cool, then cover tightly and store in the refrigerator for 3-4 days. To freeze and reheat, let the casserole cool, and then transfer to a freezer-safe 9×9 inch dish. Cover tightly with aluminum foil and store for up to 60 days. To reheat, remove directly from the freezer and bake at 350 degrees for 45 minutes. Uncover and bake for 10-15 minutes longer, until it starts to bubble and is warmed all the way through. Heat a pot of water to boiling. Add the pasta and cook as directed on the package. Drain the pasta reserving 1/2 cup of the water. Drain the pasta well and leave in the pot. Add the butter to the cooked warm pasta and stir until melted. Heat the evaporated milk in a saucepan over medium heat. Stir occasionally until it just starts to simmer. Turn the heat to low and add the cheddar cheese and Monterey Jack cheese. Stir until melted. Then remove from heat and add the 1/2 cup of reserved water from the noodles. Season with salt and pepper. Then add the cheese sauce to the cooked pasta in the other pot. Stir well until all of the pasta is coated with the cheese sauce. Then add half of the cooked bacon and stir into the pasta mixture. Place the mixture in a lightly sprayed 9 x 9 baking dish. Sprinkle the other half of the crumbled bacon and Parmesan cheese over the top. Broil until the top is golden and begins to bubble. About 2-3 minutes. 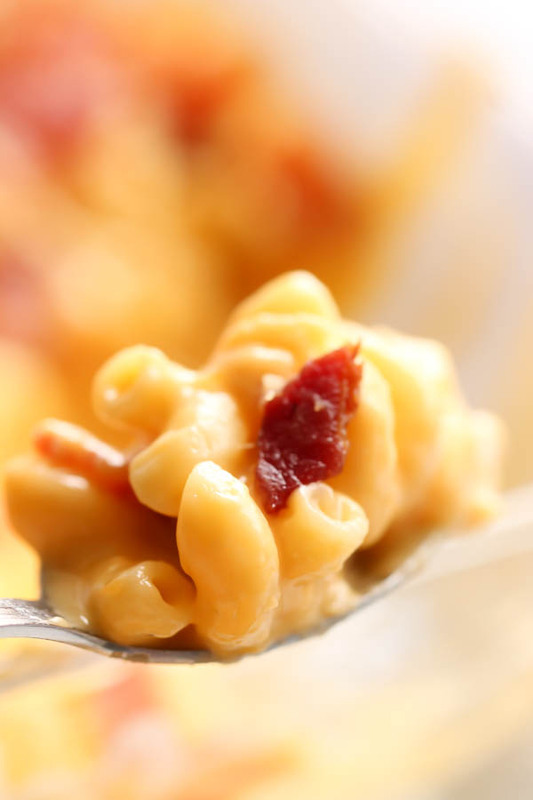 If you love our Bacon Mac and Cheese, you’ll love this video of our easy Instant Pot Mac and Cheese, too!